Euro pallets measure 1200mm X 800mm and conform to full European regulations. These pallets were introduced to reduce the number of designs currently available across Europe in an attempt to standardise the industry. The strict regulations even have guidelines to which timber and nails should be used in the manufacturing process. A euro pallet must use at least 78 nails of a certain type which should follow a specific nailing pattern. The final weight of the pallet should be between 20 and 25kg. To prevent mould dry wood is used. 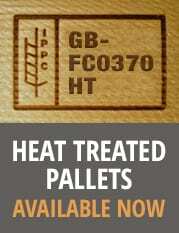 Made to the top quality european specification these pallets are marked with the official european stamps. 3. Heavy Duty Non Stamped Euro – Holds up to 1 tonne in weight. 4. Med Weight Non Stamped Euro – Holds up to 750 kilos in weight. 5. Light Weight Non Stamped Euro – Holds up to 500 kilos in weight. Contact us on 0121 553 1910 with any pallet requirements you may have.